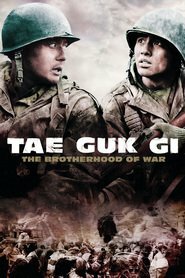 Overview... a shoeshine boy unwillingly drafted into the South Korean army in order to protect his younger brother Jin-seok. Jin-tae hoped to rescue him by force but ended up joining the war effort himself in spite of a policy that supposedly prevented conscription by more than one son in a family. Jin-tae’s primary objective is to keep his brother safe, volunteering for every risky mission in hopes that Jin-seok will be spared. Personality... courageous and heroic to the point of obsession. Jin-tae knows that the brass have the power to send him home on humanitarian grounds, and so he does whatever he can in order to curry favor. His family comes first, even before his fellow soldiers, so he wants to stick around in the army to help keep Jin-seok safe. But Jin-tae’s willingness to take on any mission gains him much adulation, eventually causing him to lose sight of the morality that got him there to begin with. Lee Jin-tae's popularity ranking on CharacTour is #4749 out of 5,000+ characters. See our top-ranked characters and read their profiles.